Its strawberry season! 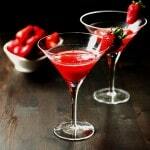 What better to celebrate with than a Strawberry Martini? The city I live in, Abbotsford BC, is known for its berries. In fact it is often called the Raspberry capital of Canada, but its more like the berry capital of Canada. Or maybe even the world! Sometimes it seems as if everyone here either has a berry farm, and uncle with a berry farm, or has worked on a berry farm lol. While that might be a little far fetched, you would be hard pressed to find a person who grew up here who hasnt gone berry picking once in their life… When I was little, my mom used to take my brother and I to the U-Pick farm where we would pick/eat berries till our tummy’s or pails were full. Whichever came first. We are a little spoiled in this part of the world, when it comes to strawberries. The fresh and local ones we get at this time of year are so incredibly juicy and sweet, it almost makes it tough to buy strawberries the rest of the year. They are so fresh that the other day, I was at a produce market at 9 am to get strawberries and I had to wait because that mornings shipment from the farm hadnt made it in yet. 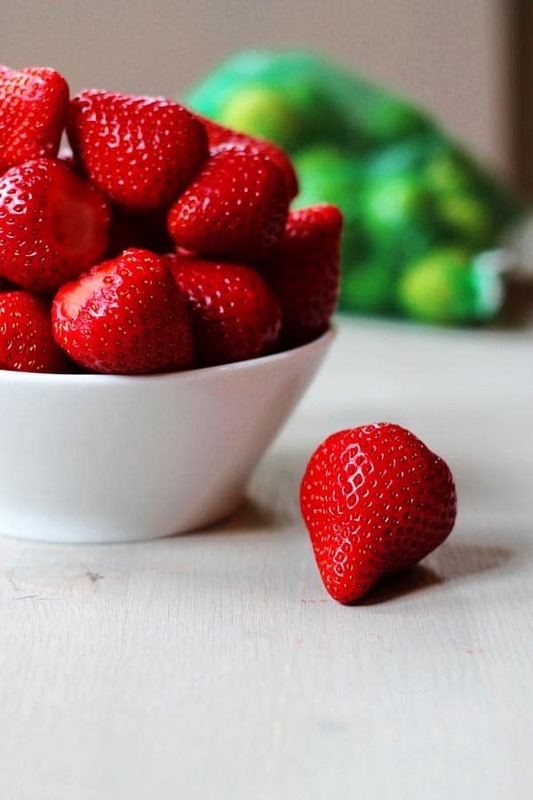 I will gladly wait for freshly picked strawberries! 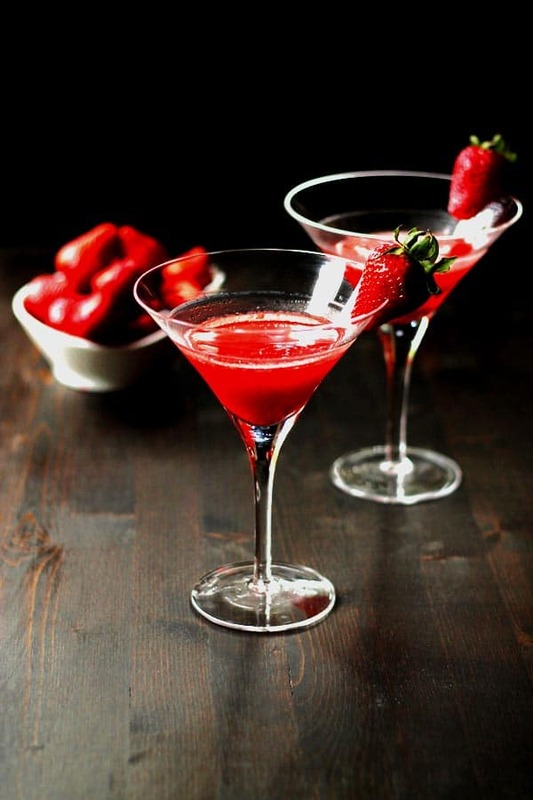 You dont have to have local strawberries to make this martini, but if you do, take advantage! Debbie and I first found this drink at Cactus Club and now we have it every time we eat there, but we had to figure out a way to make them at home too. I think ours is pretty damn good. You might look at the ingredient list and think “WTF, why is there vinegar in there?” But trust us, we know its weird, but it brings out the strawberry flavor just a bit. Just like a splash of balsamic when you macerate strawberries for a sauce. 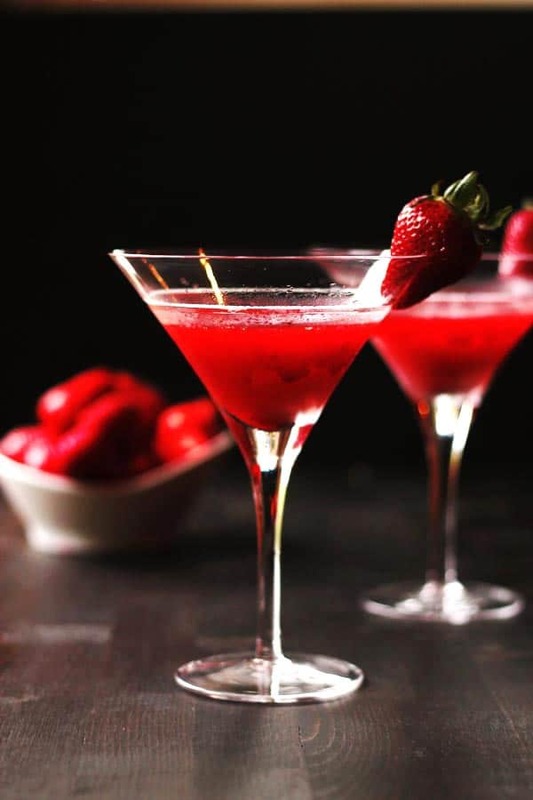 We like a little bit of pulp in our martini, especially when the strawberry flesh is so perfect. But you can just use the strained juice if you prefer. 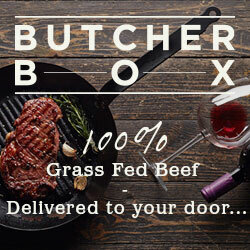 Our recipe differs a little bit from Cactus Club in that we use lime instead of lemon. We like lime better and we always have it in our fridge, but you could use either. 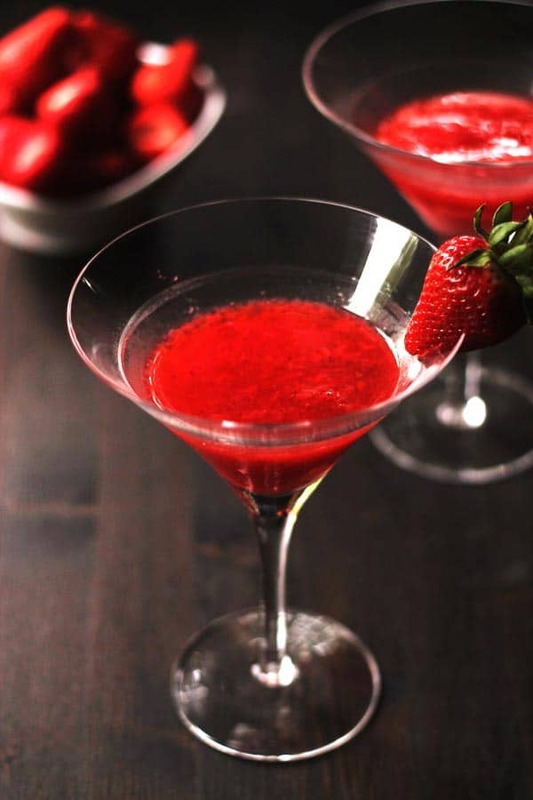 If you love strawberries and you love martinis, your going to be in heaven with this one. Wash and hull your strawberries. Cut them into smaller pieces and place them in a tall glass. Muddle them until they get very mashed. Strain the juice into a chilled martini glass. You will need to use a spatula to push the juice through the strainer. Add some of the pulp if you wish. Add the rest of the ingredients to the glass and give it a good stir. Grind some fresh pepper on top if you desire and serve.